Install Truck Diapers under vehicles and equipment. Truck Diapers hang securely underneath any size truck or heavy equipment to catch oil drips, hydraulic fluids, anti-freeze, and prevent hydrocarbons from falling to the ground. Truck Diapers allow water to flow freely away while capturing oils. 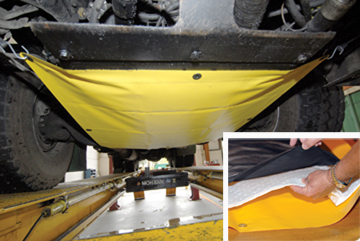 The Oil-Only Absorbent Pad is easy to install and replace, while the yellow outer diaper can be reused over and over saving your company time and money. Go Green and be Ecologically proactive! Outfit your vehicles and equipment with Truck Diapers. Perfect for jobsites in sensitive areas. Available in 2 sizes - Medium and Large. PVC with vinyl coated mesh insert and brass non-ferrous grommets. Replacement pads come 25 pads/Bale. Pads are made from Laminated, heavy weight polypropylene. Freight rates are estimates only and may vary due to fuel surcharges that change daily.